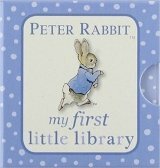 A little box of first books featuring Beatrix Potter's classic character, Peter Rabbit! My First Learning Library contains four chunky board books that introduce the youngest children to early concepts. The titles are: Words, Numbers, Shapes and Colours. The palette is soft and illustrations are in the classic Potter style. Each double page contains a single illustration and just one simple word. These hard-wearing board books will soon become firm family favourites, and are the perfect introduction for very young children to the wonderful world of Beatrix Potter. Beatrix Potter is regarded as one of the world's best-loved children's authors of all time. From her first book, The Tale of Peter Rabbit, published by Frederick Warne in 1902, she went on to create a series of stories based around animal characters including Mrs. Tiggy-winkle, Benjamin Bunny, Jemima Puddle-duck, Mr. Jeremy Fisher and Tom Kitten. Her humorous, lively tales and beautiful illustrations have become a natural part of childhood. Today Beatrix Potter's original 23 tales are still published by Frederick Warne, alongside a wide range of other formats including baby books, activity books and gift and sound books.